I’m a huge fan of Mac OS X’s Quick Look feature, which lets you preview most types of documents by simply selecting a file and pressing the spacebar. I especially like that third-party developers can extend Quick Look’s functionality via plug-ins. I’ve previously covered several such plug-ins, but whereas most add support for more document types, Code Line Software’s SneakPeek Photo enhances Quick Look by providing more information about already supported images. With SneakPeek Photo installed, Quick Look previews of most images include detailed information about the file as well as metadata provided by the digital camera that took the shot. Always visible at the top of the preview are the file name and type, size, f-stop, exposure time, ISO, focal length, and a mini histogram. 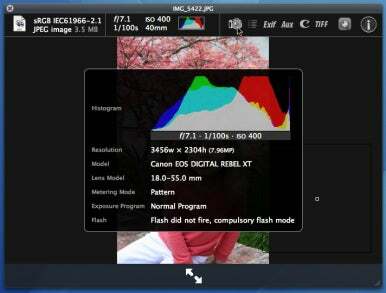 But move your mouse cursor over the various icons to the right and you can view detailed data about the image, camera, and lens, as well as all EXIF tags. If an image is geotagged, you can even view the location, on a world map, where the photo was taken, along with the exact coordinates of that location; click on the geotag button to view that location on Google Maps in your browser. Finally, one of my favorite features is the capability to force Quick Look to show even larger previews of high-res images; these previews also include a loupe tool for enlarging the part of the image under the mouse cursor. The only drawback to this feature is that these larger, loupe-enhanced previews are slower to render than standard previews. I encourage you to check out Code Line’s online interactive demo, as it’s far more compelling than the static image shown here. SneakPeek Photo is a great enhancement to an already useful feature, and one that will appeal to both photographers who want a quick way to view detailed previews of their shots, and to aspiring photo bugs who are curious about the settings used to capture particular images. And because it’s enhancing Quick Look, you can use SneakPeek Photo on Mail attachments, in Open and Save dialogs—anywhere Quick Look works.